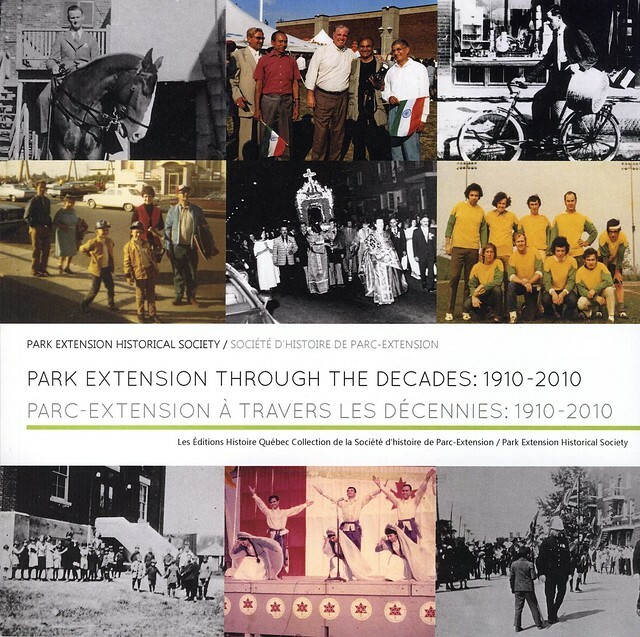 The SHPEHS was happy to host Calgary-based journalist Marcello di Cinto in September 2011, as he researched the Acadie fence for his upcoming book In The Shadow of the Wall. Society member Nick Semeniuk, who showed Marcello around the neighbourhood and shared his memories of growing up in front of the fence, ended up featuring prominently in an article about the visit. You can read the whole article on the Geist Magazine website. Nick also shared two pictures of his brother John on Acadie street (then known as McEachran) around 1956. 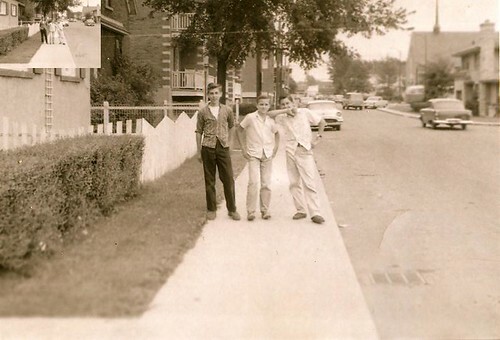 Mike Mahoney, Bobby Boa & John Semeniuk on McEachran street (now Acadie). Photo looking south, with house number 7275 on the left (now an apartment building) and the Hungarian United Church (built 1955) on the right in Town of Mount Royal, at the corner of Jean Talon/Dresden street. Taken circa 1956, before the widening of McEachran street and installation of the Acadie fence. 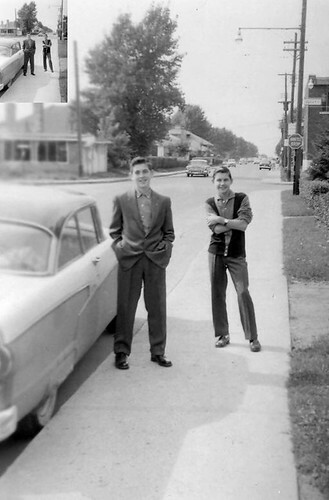 Mike Mahoney (lived on Birnam near St-Roch) & John Semeniuk (of 7275 McEachran) circa 1956. Photo taken facing north on McEachran street (now Acadie) at the corner of Ogilvy. Visible on the left, on Broofield street in Town of Mount Royal, is the house and greenhouse of longtime TMR mayor Vera Danyluk. Her husband Victor inherited the greenhouse. One block to the north, on the left, is the Rockland Golf Course. La Sciété d'histoire a été fier d'acceullir le journaliste de Calgary Marcello di Cinto en septembre 2011. Il visitait le quartier pour en savoir plus à propos de la clôture sur Acadie, qui sera un sujet de son prochain livre In The Shadow of the Wall. Notre ami et membre de la Société Nick Semeniuk lui a parlé de ses souvenirs d'enfance, car il a grandi sur Acadie avant que la clôture soit érigée. Ses souvenirs, ainsi que d'autre réflections, sont dans l'article disponible sur le site web de la revue Geist. Nick a aussi partagé ces deux photos de lui avec son frère John devant leur demeure sur la rue McEachran (maintenant appellé Acadie), vers 1956.